Tonight I found the time to scrub and soak them, so that I can put them to use. It's my 40th birthday this year, and I'm booking tables at a local games shop to play some WH40k on Sunday 23 Sep. On the off chance that any of you are in the vicinity of Redhill (Surrey, UK) then let me know and I'll add you to the list. Having a play date set should help with motivating me to do more modelling (and who knows, painting?). I needed some stress relief, so I sat down yesterday evening and cut up some plastic. 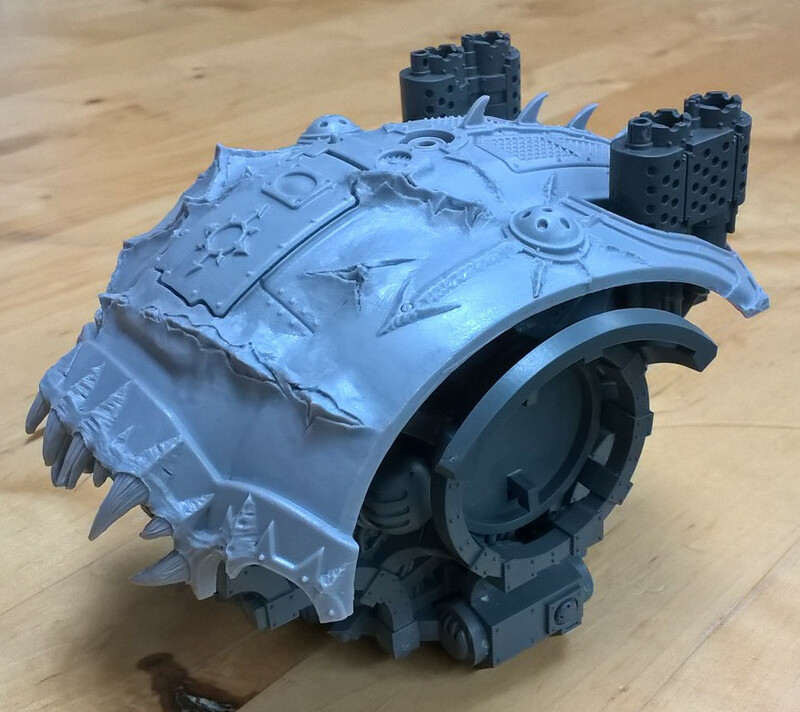 One of my misguidedly generous friends bought me the Forge World Chaos Knight as an early 40th birthday present (whilst free shipping was an option recently, thus sensibly saving the 12% postage cost). It would be good to get it started before he visits in September. But also I've been really excited by this model and am delighted to be able to get stuck into it. At this stage, I've nearly completed the upper body, as you can see (excluding the heads and arms). That carapace isn't glued on (it's not even fully cleaned up yet) but I really wanted to check its fit as soon as possible given the fiasco of the Plague Hulk. 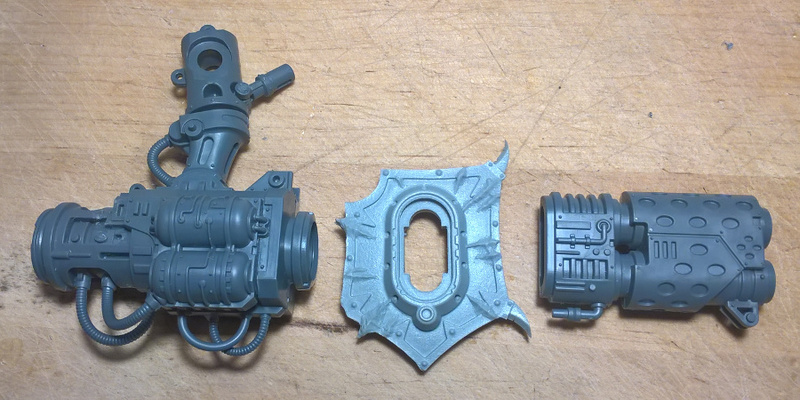 As a reminder of that: it turns out that the resin used for the Plague Hulk shrank more than the plastic, so the resin upper body doesn't fit onto the Defiler leg base, and to fix it you need to do some significant remodelling. 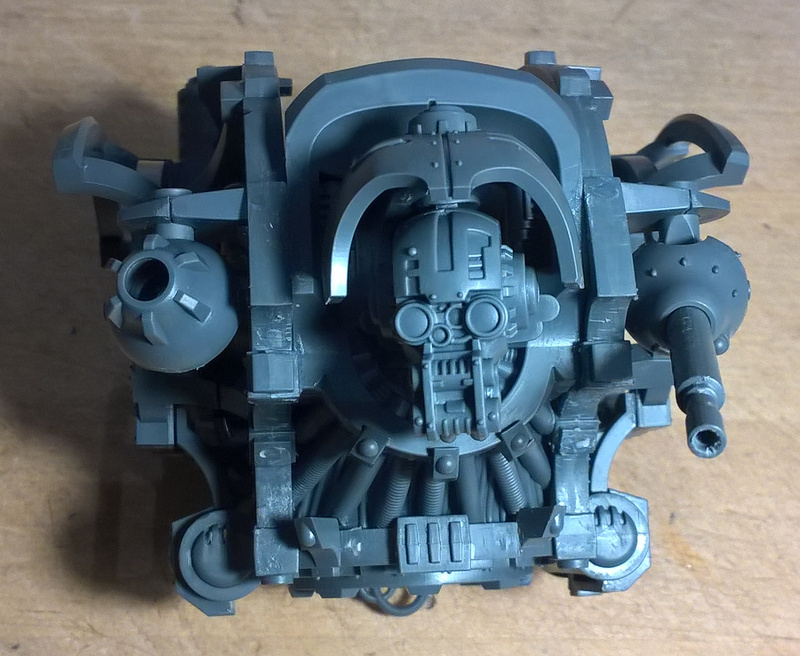 Thankfully the recipe used for the Chaos Knight is an improvement, and the pieces are a superb fit (I'll just need to warm the resin in some hot water to get it to bend a little in order to get it perfect). Without a doubt, this is a model that needs painting in separate sub-assemblies before final construction. I'll build and paint the (plastic) skeleton separately from the (resin) armour panels. One disappointment with the Games Workshop Imperial Knight model is that the legs are monopose! I've read various articles on the internet from folks that have cut and rebuilt the leg joints in order to introduce better poses. I've wimped out of that, and have instead ordered a set of poseable Knight legs from Souldark. 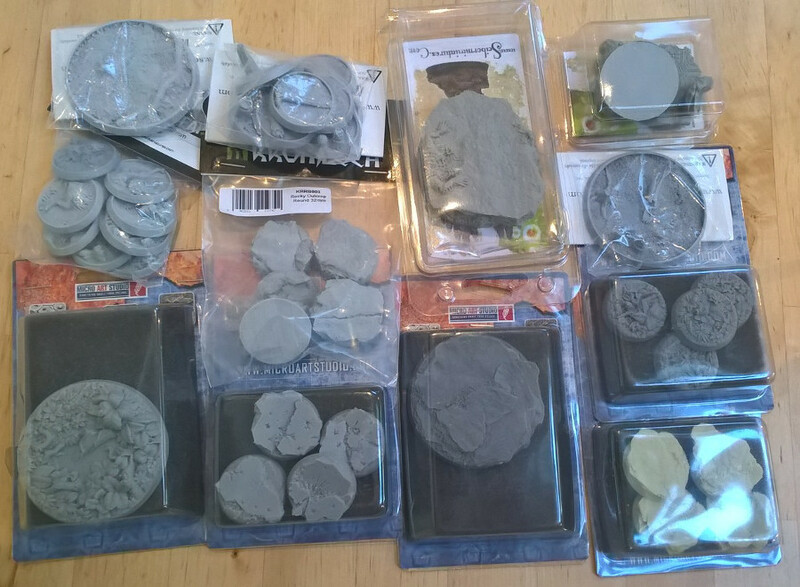 I also want to order a resin base from Wayland Games, along with some basing detail. The kit does not have posable legs? That is poor, so far I know it does have "fully" posable fingers... lol. Wow! That thing will be lovely as heck once you have it all sorted and stuck together. Good thing there are 3rd party producers who offer an alternative to the mono legs. Bit shortsighted of GW imo on that. That’s an awesome score! I’d love to play around with something like that but there’s no way the wife would go for it. Any idea on the paint scheme? You could always send it to Phillip so he could paint his stripey white paint scheme. Happily in this kit the resin and plastic pieces that I've tried together are a good fit (the main carapace and the face). Given how well they're fitting, I'm sure that the rest will be good too. It really does look like Forgeworld have learned from their past mistakes and improved their resin recipes. Any idea on the paint scheme? Just a sketch at this stage. My plan is to paint the armour plating separately from the skeleton before a final assembly. 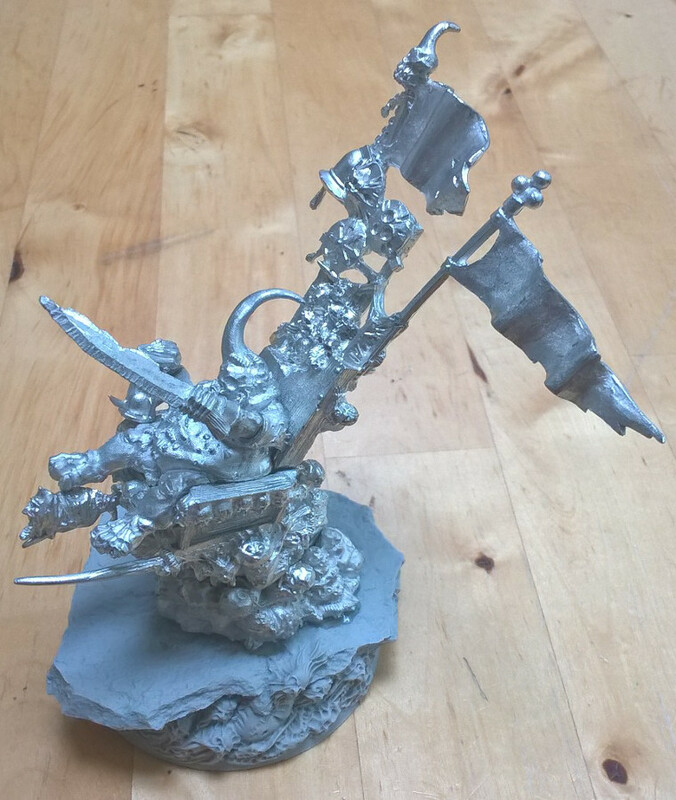 I'm thinking of dark metal for the skeleton, with corrosion in the appropriate places. I happen to have a spray can of Dark Angel Green, so I'm thinking of using that for the main colour of the armour sections (which will complement and yet contrast with the greens and browns of the rest of the army). I'll do the spikes in a bone colour; I'm considering whether to do the armour trim in the same colour, or whether it should contrast with the bone (perhaps a rusty brown instead?). Red for the eyes. And I want to add some text to the shin pads, obscured by the chaos sigils: "ENDURE" on one and "PERSTO" (Latin, or High Gothic, for "I continue standing") on the other. There are a lot of different areas to the model, and coming up with a suitable scheme that is both coherent and properly picks out each area isn't trivial. This will certainly not be something I'll paint soon; I want to build up a lot more experience with smaller models before I chance ruining this beauty. A fine question! Last we saw him, he was missing a base and I was fashioning something experimental out of slate. You'll see that I also attached the tusk-Nurgling. 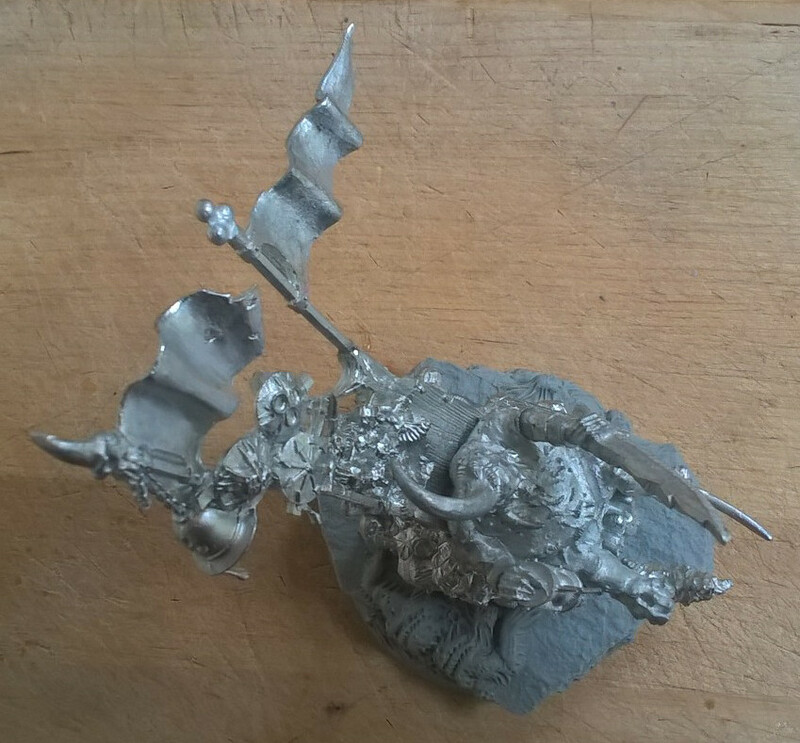 I deliberately put loads of glue underneath Epidemius to let it seep out the sides: both the fill the gaps and to make a small pool of slime surrounding him. Now that the glue has dried, I can patch the base with additional Nurglings where appropriate to hide rough bits and to enhance the look. I also need to add a piece of Barbed Bracken - I'll be using a piece of that on every base in order to have an element that links them all together even when the individual base designs differ. And beyond that, I also did some more clean up on the Knight yesterday evening, cutting off flash, pipes, and mould lines from about half the resin pieces. Once I've cleaned up all the pieces, I'll be able to wash them too so that I can compete the sub-assemblies. That bracken is pretty cool. It reminds me of the little scarab things the Necrons used to have. I progressed more on the Chaos Knight last night. Aside from cleaning up a few more rein pieces, I also completed the work on the upper body: the head, heavy stubber, and ion shield mount. These are fiddly pieces consisting of multiple small components. At this stage various parts are not glued. The head is attached, but still mobile, so that I can decide on a final position before fixing it in place. The canopy above the head is not glued on at all, so that I can paint it along with the other (mostly resin) armour pieces separately from the metal skeleton. The stubber is similarly attached, but mobile, waiting to be finally positioned. And the round piece of armour shielding around the stubber is also not glued, so that again it can be painted with the other armour pieces. Finally the equivalent round armour piece that backs the shield is again not glued on (gluing this piece on also fixes its angle). In other news, yesterday the set of poseable knight legs arrived from Russia! The pieces are all present and correct. I look forward to piecing them together, probably pinning them for additional strength. I can't pose them fully yet though, as I only just (today) ordered the base and basing detail for them to go on. Having thought more about the colour scheme, I plan to do the armour trim in a bone colour, in line with the spikes. This will visually blur the line between armour and spikes, suggesting that one is the continuation of the other. Pretty cool seeing you detail this build. Gives a better idea of how this kit comes together. Last night I cleaned a sprue of Barbed Bracken. That was all. It took all evening! Like the vines, the bracken is made of bendable plastic, and that made it surprisingly hard to work with. I'm so used to components being hard (metal, plastic, resin) and being able to push against the surface using its solidity, or scraping a knife over it to remove mould lines. Doesn't work with the bendy stuff. So different techniques needed, and it took longer than I expected to complete. Still, that's one sprue of four now neatly cut, cleaned, and placed into bags. This is the last thing I need to do before starting painting the models that I was using in my previous battle. Every based figure in the army will get a piece of bracken on it, and that will act as a unifying feature (hinting at Nurgle's garden) to overcome the variety in bases. From tomorrow I'm in South Korea for another week, so painting in July hopefully?